Oops. I seem to have bought another live steam locomotive. I really wasn’t intending to. When a Regner importer at the Exeter Garden Railway show confirmed to me a rumour that several of the Easy Line trains were being discontinued (Max, Willi and Konrad) I was disappointed – they’d all be on my original shortlist, and though they were then pipped by the Millie, I thought “maybe one day…” And now I’ve become even more convinced that a flywheel would be very useful for the smooth running I’m after (and gears wouldn’t hurt!) they’re the only real alternatives to something with a slo-mo (the money-no-object ideal). So even though a second steamer was definitely not on the cards right now (honest!) and such funds as the railway had available were allocated for permanent way extension, when Glendale Junction announced they had one in, I couldn’t pass up the chance. I’m very pleased with the slow running. But as for lighting up… let’s put it this way, I have suddenly realised how good the Millie is in this department. There’s definitely a knack to it. That’s in addition to the gas jet being blocked (twice) which the helpful gentleman on the phone did warn me would happen! The gas filler is absolute nightmare – I was told I’d get the knack but I’m still wasting more gas than is going in! 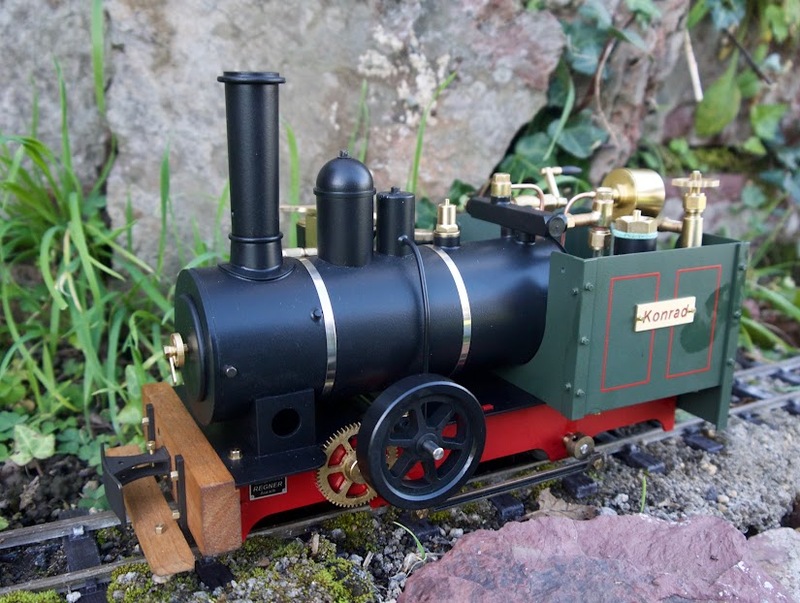 Then, on second steaming, I had a further problem: pressure dropping and the loco stalling… which turned out to be due to stiffness caused by my poor lubrication of the shaft connecting the cylinder to the flywheel! Repair made, but lesson learned. To my surprise this is a fun loco to shunt with. I’d assumed radio control would be a prerequisite to enjoyable shunting and this is well (indeed, only) suited to manual control. But it’s so easy to start and stop: just set the reverser and flick the flywheel, the slow speeds making it very controllable. And set it running round the track and it will potter along at a delightfully sedate pace, neither struggling on the tight curves nor speeding away on the straight, just keeping a perfectly even pace as the cylinder oscillates busily. Although the gearing means the beats are too frequent, the loco also has a nice loud chuff. No need to add a chuff pipe! The appearance of this ugly duckling of a loco has grown on me since the first time I saw it, its charm being a key factor when I decided to buy it. I felt I could happily overlook the unprototypical side-mounted cylinder – this is narrow gauge after all. I did get a twinge when I saw how off-centre the boiler is, but overall I rather like its ‘interesting’ appearance. Despite that I’m keen to find ways to anglicise it: straight away I sacrificed a muesli packet to help think out some cosmetic adjustments… of which more, soon.